On Wednesday, April 13th during the ½ Day District-wide Professional Development for teachers, five of Scotland High School students enrolled in Trades & Industrial classes (Plumbing, Electrical Trades, and Drafting), were encouraged by their CTE teacher Mr. Kevin Goins to visit Richmond Community College’s Engineering Programs located at the state-of-the-art Forte Building. Shane Dubbs, Kyle Ferrell, Patrick Maultsby, Hunter McGee, and Kasey Snuggs, realize that a high-quality education in science, technology, engineering, and math is as valuable as ever. During their visit, the students were given a personal tour of the college’s substation, which is an outdoor lab for students enrolled in the Electric Utility Substation and Relay Technology Program (EUSRT). Kyle Ferrell said, “My overall impression of the substation program is that RCC has put a lot of time and money into it to allow students like me an opportunity to go into a career that’s in need of workers”. After the visit, each student stated that they are considering enrolling in the program once they graduate from high school. Since they have already completed several CCP courses through RCC, they are eligible for RCC’s RichmondCC Guarantee which will allow them to earn their Associate in Applied Science degree tuition free (http://richmondcc.edu/Guarantee). Additionally, RCC is the only college in the country to offer such a two-year degree program and is also the only college in the country with a working substation on its campus. To view the EUSRT Program of Study, please visit https://goo.gl/LrU83g. 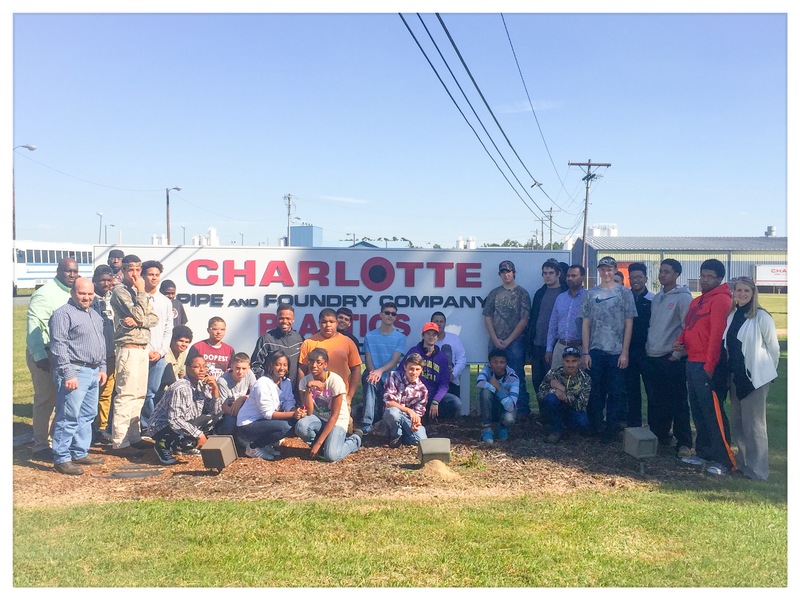 The Trades and Industry department at Scotland High School had an exciting visit to the Charlotte Pipe Foundry on October 21st. Mr. Goins (Plumbing & Core Instructor), Mr. Oxendine (Electrical Trades & Core Instructor), Mr. Williams (T&I Instructor), and Mrs. Whitehead (T&I and STEM Instructor) chaperoned over 30 students on this exciting work-based learning event. The trip included an overview of the organization, a tour of 6 on-site facilities, along with learning about the many career opportunities available with the organization. This industry has available employment opportunities in 10 of the 16 national career clusters. Most interesting about the trip was the emphasis on Advanced Technology, Math, and Science as well as 21st Century Skills necessary that helps to make this one of the leading pipe industries in the nation. With over 100 years in business, employing over 1300 employees, the company takes pride delivering a high quality product through first class service, emphasis on increased productivity, and putting people first including improved employee morale by developing a family atmosphere which attributes to a low employee turn-over rate. LAURINBURG — Select Scotland High School students received free computers this week through a program called Project BauHow — and one lucky student will attend a summer design camp. Each student that was given a computer is required to submit a project in May that will be judged by a panel of Scotland staff. The winner will be selected to attend a design camp at North Carolina State University this summer. “It’s a good opportunity for me, especially being a freshman,” said Jada Adams, the only freshman in the group. Other students are excited to receive the CAD software, which stands for computer aided design. The project was created through the company North Carolina Modernist Houses, a non-profit company that relies solely on donations in order to better the students and future of architecture by providing CAD software. The overall goal is to give students the chance to better themselves through educational equipment. All of the students that received the computers and software have a career interest in engineering, architecture or construction. “I really want to be an architect and this is going to help a lot,” said junior Kayla Simmons, who is eager to take the computer home and start on her project. Each student will design a modernist house on the CAD equipment for the project. The software can assist in building and drafting architecture. Goins hopes by providing the CAD system, Scotland High School students will be as good, if not better than the competition. Abby Hackmann can be reached at 910-506-3171.